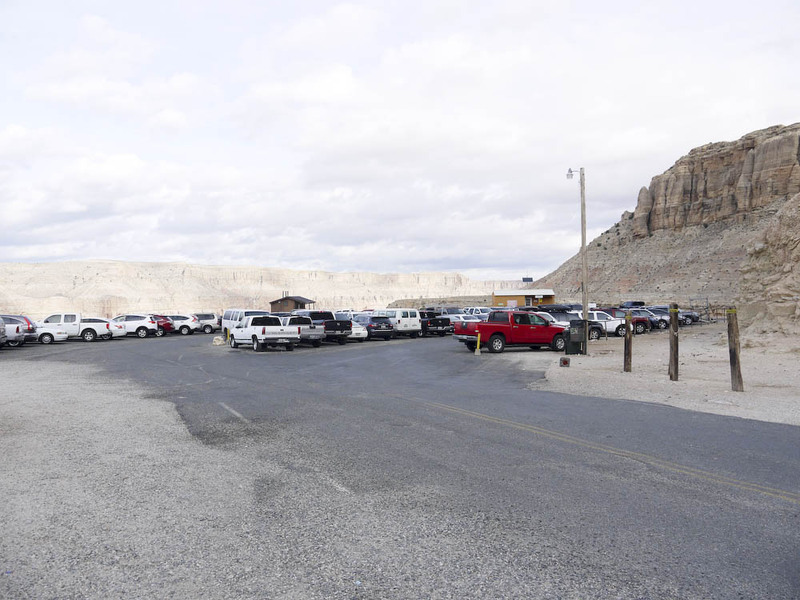 Special Conditions: Advance permit reservation needed for over night camping and lodging. 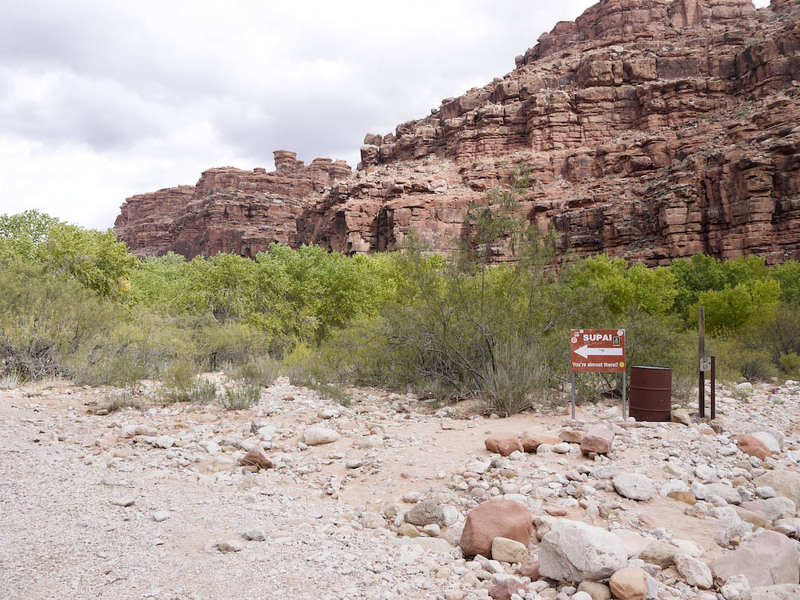 Water is not available throughout the hike into the campground, drinking water is available inside the Supai village and campground. Duration: 2 days for us, 3-4 recommended for less experienced hikers looking for a more relaxing trip. 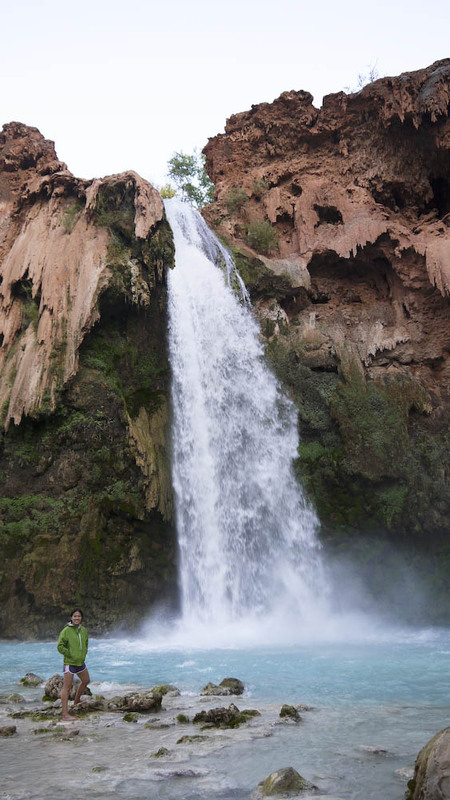 Havasupai Falls, located in one of the lowest points of Grand Canyon has been on our list of to-go places for quite some time. We attempted to visit the water falls last year but learned visiting the falls during late summer usually comes with flash flood warnings. 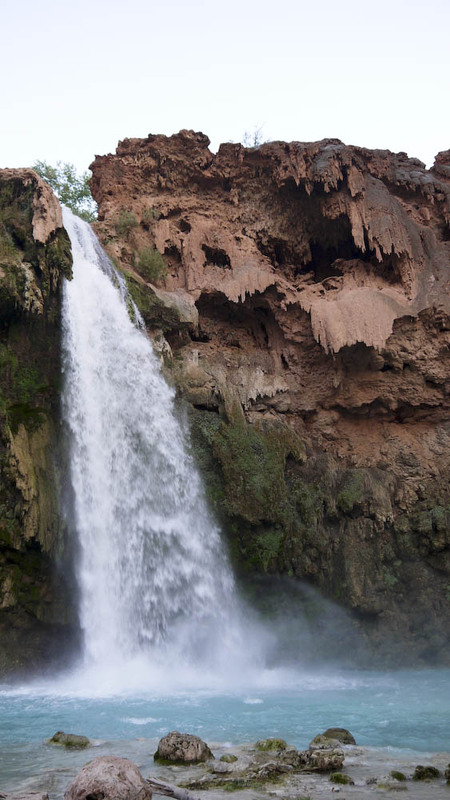 Located 2 miles from the Supai Indian Reservation inside the Grand Canyon, the camping sites near Havasupai Falls is prone to flooding from frequent and heavy thunderstorms that are prevalent in the late summer. This year, Louis’s sister booked the trip a couple months in advance early in the summer, we had planned to camp for two days but because of our busy work schedules, we were only able to fit in one night of camping. Advanced reservations are highly recommended for this hike by calling the Tourist Office and Campground at (928) 448-2121 or (928) 448-2141. The total fees for one night came out to be a little over $60, this includes the entry fee, environmental fee and camping fee. Additional nights of camping after the initial first day is only $17/night. Louis and I left Orange County at noon on Friday to avoid to Halloween traffic going towards Las Vegas. As expected, we missed the bulk of the California traffic and arrived at the Hualapai Lodge in Peach Springs, AZ, around dinner time. This is was the closest living accommodation Louis’s sister found to the trailhead, it is about 80 miles away from the Haulapai Hilltop. We woke up at 6AM the next morning with the plan to arrive at the Hualapai Hilltop trailhead around 9AM. We were concerned with the weather forecast showing a 40% chance of thunderstorm midmorning with 35mph winds. Cell phone connections at the Haulapai Lodge is not available for both AT&T and T-Mobile carriers. There is free wifi available at the lodge and I ended up using Skype to call the trailhead to verify there were no trail closures due to the potential rain. It turns out the tourism office attendant had no idea there were thunderstorm warnings and told us the trails will remain open all day. Each of us purchased one overpriced pancho and headed out towards the Haulapai Hilltop at 8AM. The drive to the trailhead on Hwy 18 was a lot shorter than the originally anticipated 2.5 hours. It took us only 1 hour to get to the trailhead, granted, we were driving at the Orange County speed limit. Hwy 18 ends at the trailhead and to our surprise, the parking lot was packed! We descended over 2,000ft down into the Canyon within first 2 miles of the hike. 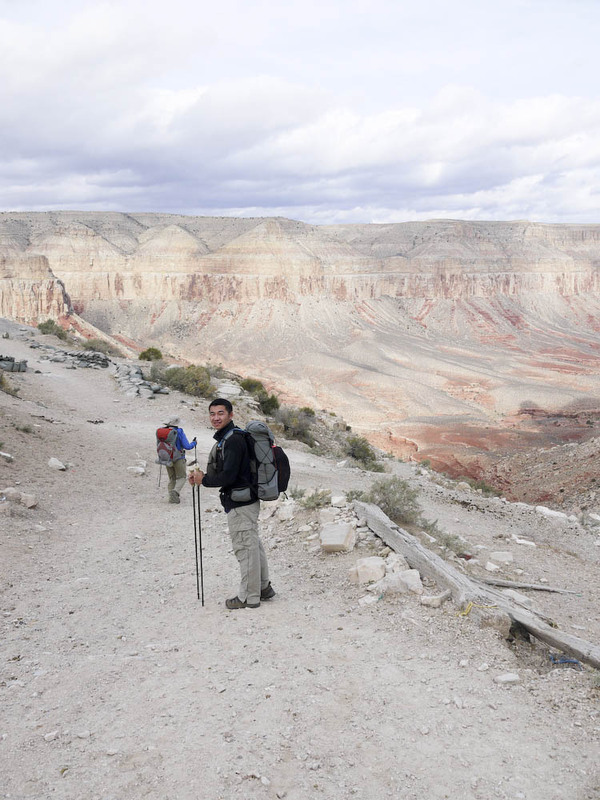 After the initial descend, the trail to Supai village and the campgrounds were relatively flat making the hike very easy for our party. If you don’t want to carry all your gear into the campsite, there is also the option of hiring horses and mules to pack our equipment in. The one-way fee for the pack animals is $75 and roundtrip is $150. 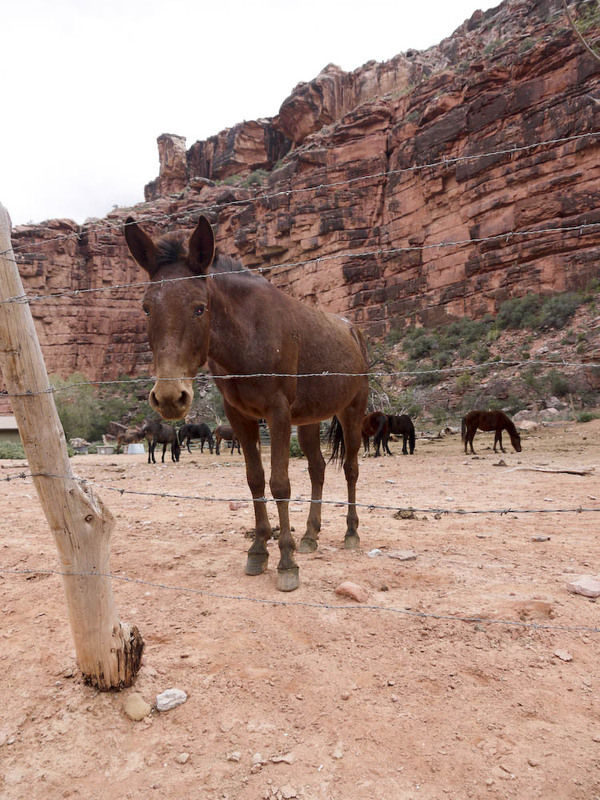 Getting choppered into the Supai village is also another means of transportation. According to their website, fees vary for the helicopter transport and they do not fly everyday. We were lucky with the weather during our hike in. With high cloud cover and low 70s temperature, it turned out to be the perfect day trekking in. 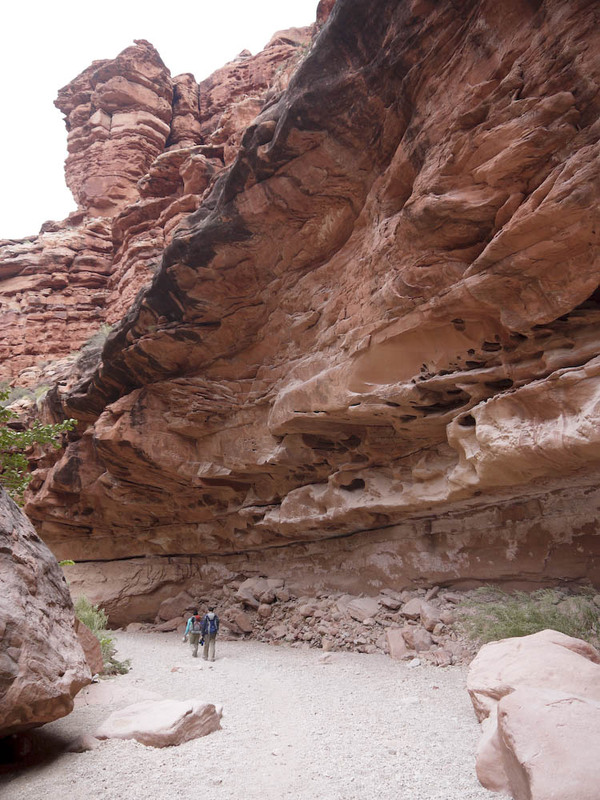 Most of the hike were similar to this, very flat making this a leisure walk into Supai Village. 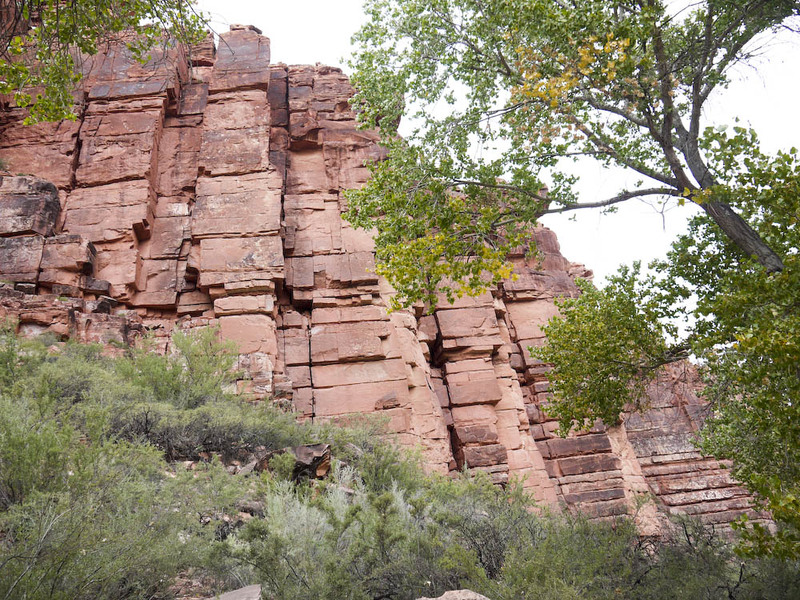 The amazing rock formations a couple miles outside the Supai village. 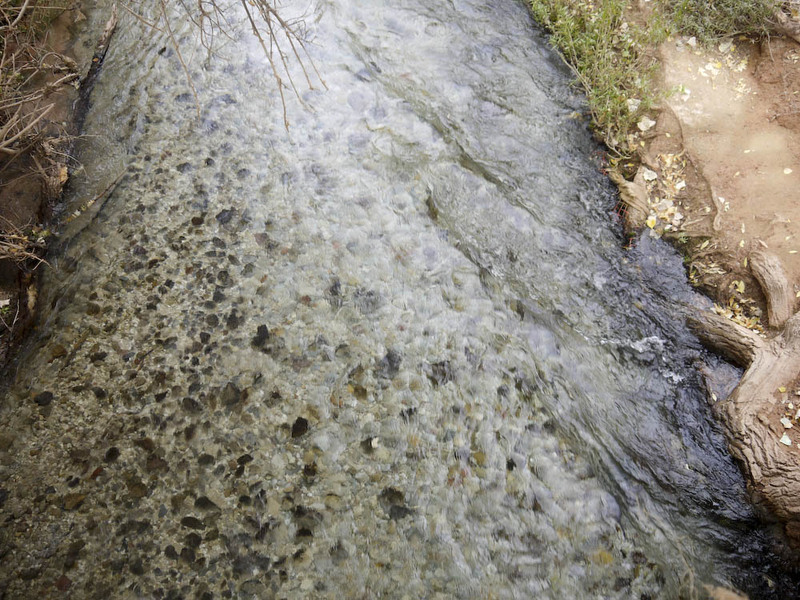 Does anyone know why the horizontal cuts between the rocks are so symmetrical? 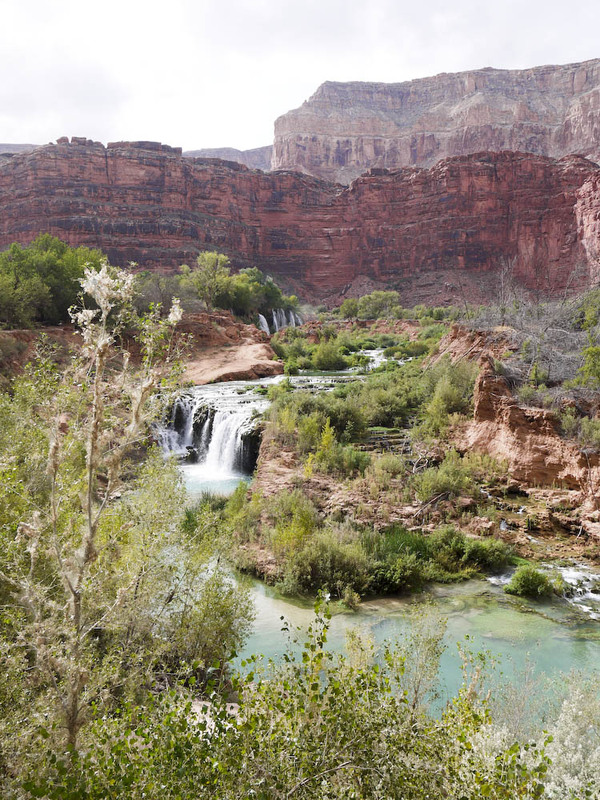 Photo of the Havasu Creek running along side of the trail, we couldn’t believe how clear the water looked! Entering Supai village, this is the 8 mile marker from the Hualapai hilltop. Mule with an eye infection looking for food. These animals seem very comfortable with people, they must get fed by many tourists and hikers walking through. 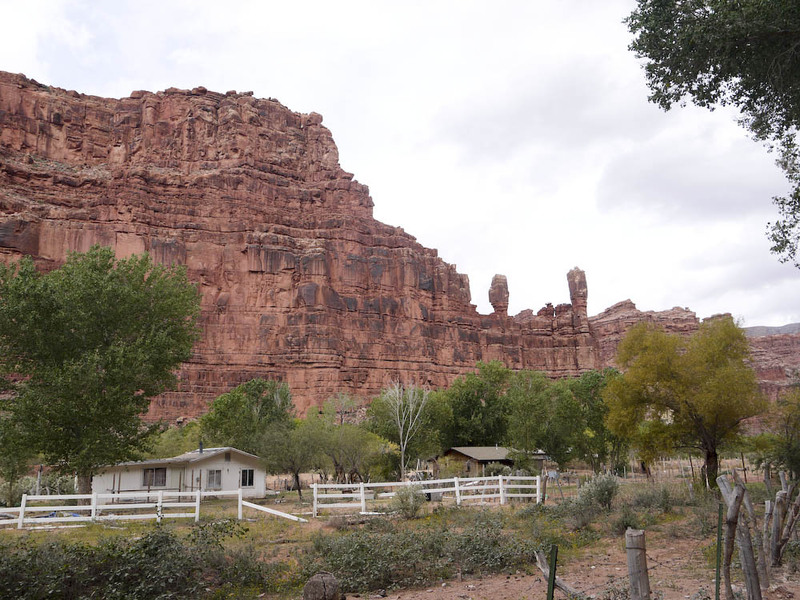 We checked in and picked up our permit at the tourism center at Supai village. There is a cafeteria in town and we decided to take a break and have lunch there. The food inside the cafeteria is nothing specular, think overpriced elementary school cafeteria food, that’s pretty much what you will be served. 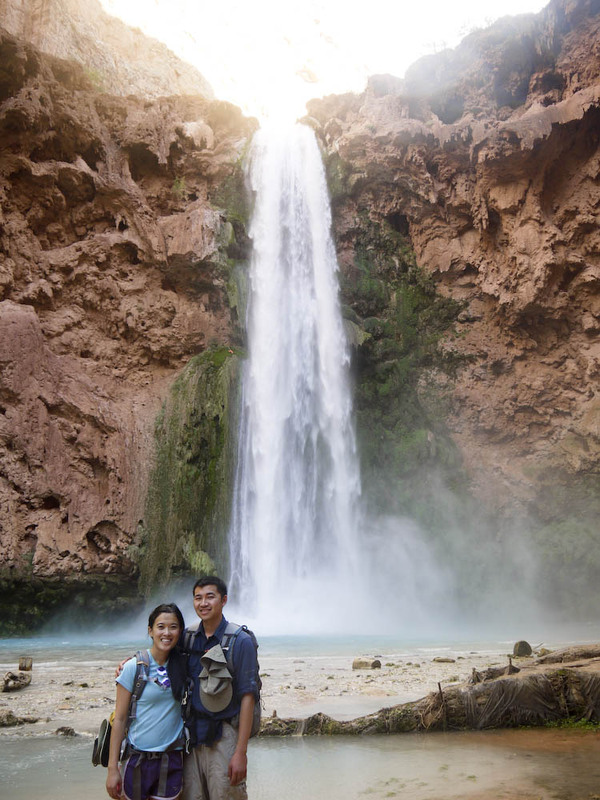 We came upon our first couple waterfalls shortly after passing through the Supai village. Upper and lower Navajo Falls are closely situated next to one another. I was taken aback by the beauty of the waterfalls despite of all the photos I have previously seen. It’s truly a beautiful oasis in the middle of the valley. We were eager to explore the rest of the water falls before sunset. 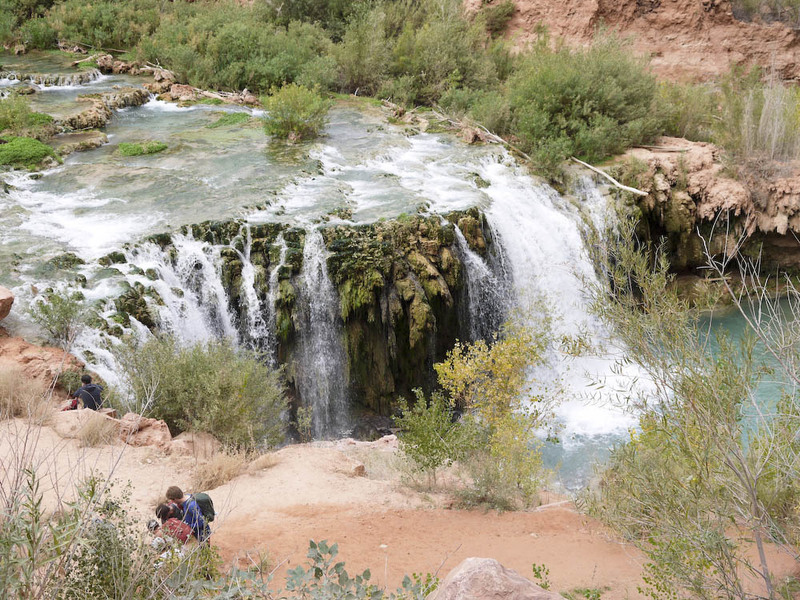 So we quickly skipped through Havasu Falls and arrived at our campsite at in the early afternoon. We struggled with setting up our tents due to high winds, it took us an hour to set up at the campsite before we headed to Mooney Falls. 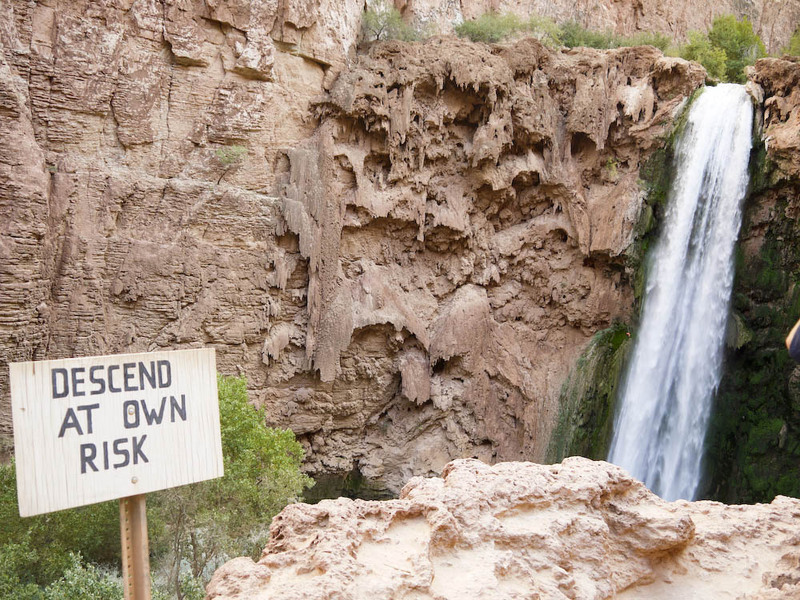 This was the ONLY sign warning hikers about the descend down to Mooney falls. 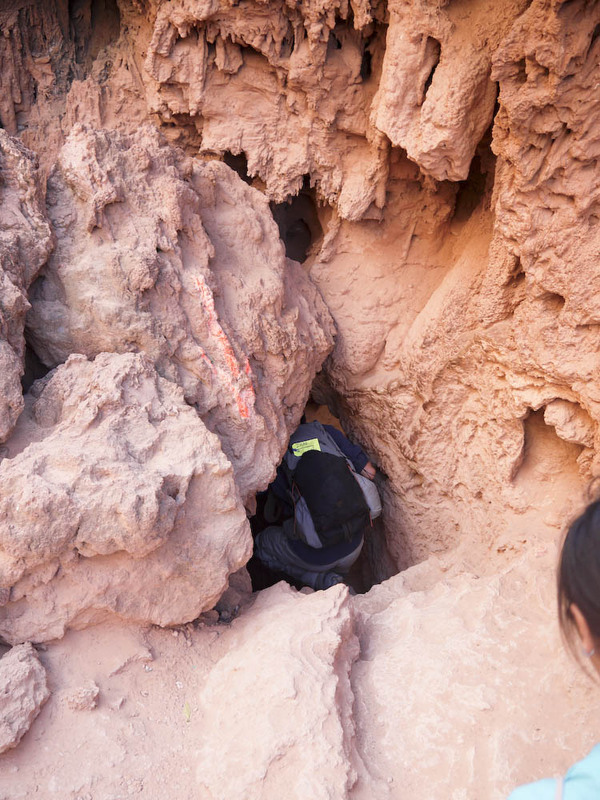 Certain sections descending down to Mooney Falls was a little scary. We did not expect the descend to completely vertical towards the end, the wet rocks from the spray of the waterfall made this a dangerous climb down to the waterfall. I do not recommend kids or older adults to go down to the water fall, an accidental slip could be deadly. Unfortunately, this is the only path to Beaver falls which is about 2 miles north of Mooney falls. To our disappointment, we ran out of time and did not make it to Beaver falls during our stay. Hikers climbing back up to the trail. Going up was definitely a lot easier and faster than coming down. We made it! The view was worth it. 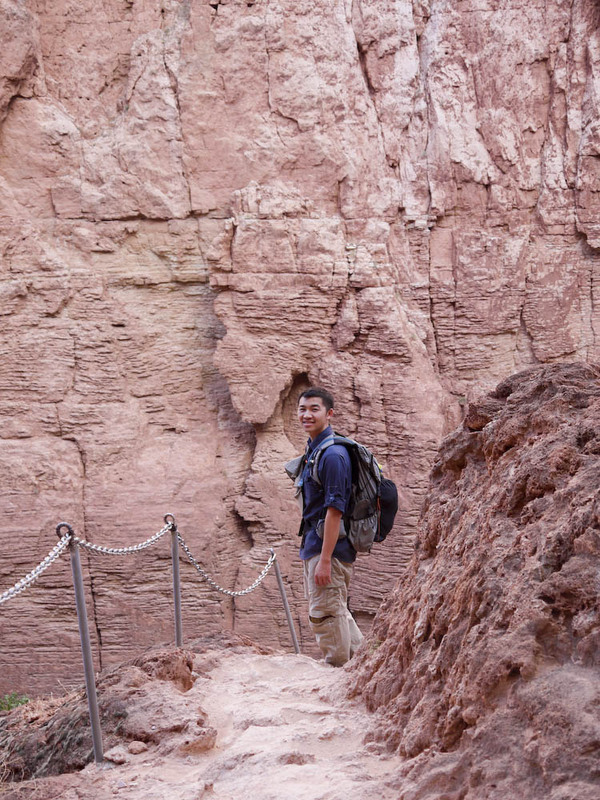 Louis and I back tracked to Havasu falls after Mooney falls. The weather held up surprisingly well and Louis decided to go for a swim at Havasu Falls. Overall, this was an AMAZING trip. I wish we could have stayed one more day to check out Beaver falls. It only took about 3.5 hours to hike back to the Hualapai Hilltop with our backpacks and we even made it back to Los Angeles to have dinner with Louis’s family that night. This is definitely a do-able weekend trip if you don’t mind the 7 hour drive. 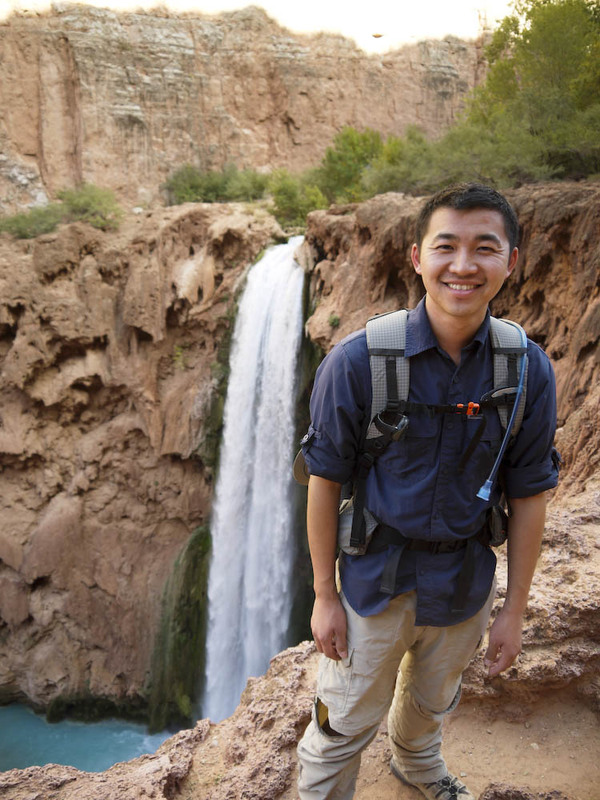 This entry was posted in Trail Reports, Travels and tagged backpacking, grand canyon, havasupai, Hiking, outdoors, traveling, waterfalls by hikenoworklater. Bookmark the permalink.